Minor lawn repair doesn't involve removing your old lawn and soil and replacing it. These are more affordable repair options, and can be done at the surface. Compaction, excessive thatch, winter kill, lack of sunlight, maintenance, drought, water retention, dog urine grass burns, and other spills are considered minor repairs. All be looked at in this section on lawn repair. 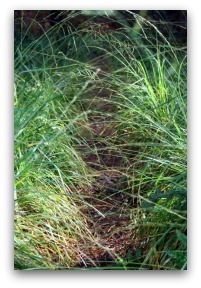 Though this path below is not like something you would find in most yards, it clearly shows how high traffic compaction affects the ability of grass to grow. We said that compacted soil is common in high traffic areas and clay soil, so how do we deal with it? One of the best methods is by regular core aeration. Spike aeration is designed more for sandy soils. There are a few ways to deal with clay soil, and these two links below are also great examples of dealing with clay soil. The first link talks about expanded shale, while the second link talks about using organics, and Humic acid. Aerating is a pretty big topic with lots to cover. We have a whole mini module dedicated just to aerating. We cover the what, why, and when of aerating. We also talk about the difference between “spike”, and “core” aerating. There are many benefits to aerating, including improving your existing soil conditions over time. Aerating is also a great way to control thatch. After aerating is done, it's a great time to seed and topdress your lawn. You will learn more specifics at this link aerating lawns. Thatch problems are another minor repair if caught in time. If not, it can become a major one over time. Power raking and dethatching involve two different methods designed to accomplish similar, but slightly different things. Which method and machine you use, will depend on your grass type and situation. Timing can be important with dethatching, so if this is your problem we have another mini-module dedicated just to dethatching. It includes what thatch is, how to prevent it, when to dethatch, and the difference between power raking and dethatching. Just like aerating, visit Dethatching for more specifics on dealing with thatch. As I sit here at mile “0” on the Alaskan Highway it's -45 C (with the windchill factor), I thought it would be a great time to write about winter kill. There are lots of reasons a lawn can experience winter kill, but the main cause is usually a weak lawn or root system. Sometimes it will recover in the spring, and sometimes it won't. So what makes your lawn or root system weak? Essentially, it is not following proper maintenance practices of watering, fertilizing, and mowing. Preventing winter kill means watering properly for a deep rooting lawn. If you are not sure what we mean, please visit our mini module on watering a lawn. A deep rooting lawn is more resilient to many of the problems we talk about in this whole module. Preparing a lawn for winter also means, fertilizing, and seeding or sodding. These things should always be done well before winter sets in and brings heavy snow an ice. This is similar to spring seeding and sodding. The right timing will allow the roots to establish and prepare for the stress of heat and drought in the summer. Timing is important for most lawn care jobs. Use the correct fall fertilizer, and don't fertilize too late. You don't want to promote active growth right before a lawn goes dormant. Almost all plants have a way of hardening off or preparing for dormancy. (Remember that grass is a plant, and should always be treated like one). Mowing grass low before winter is another thing you should consider. It will prevent matting of the lawn, and make spring cleaning and raking easier. Remember that root systems always have to sustain the grass blade above the soil. The shorter it is, the faster the recovery. You can also help prevent winter damage by making sure your thatch layer is manageable and you don't have compacted soil problems. Aerating your lawn is a great way to control both of these. Dethatching machines are for removing heavy thatch. Power raking will also remove thatch but not as effectively. Again, you can visit dethatching for more information on the two. Here is the link for our page on aerating. Spring fertilizers with pre-emergents should not be used if you plan on seeding. They stop both the weed seeds, and grass seeds from germinating. If it's too late and you have already put down a pre-emergent, you may want to consider an activated charcoal to neutralize it. Here is a link for those of you that wish more information on soil detox product. You may have areas of winter kill from salt, heavy snow, ice, dog urine in a concentrated place, or snow molds. You should generously water these areas as soon as the frost is out of the ground. Spring power raking can also help. If you still have sections that don't respond to spring watering and fertilizing, you may have to do some reseeding. If this is a yearly problem (like down the side of your driveway), then try alternative ground covers. Many people now have replaced these sections of lawn with decorative rock and hearty shrubs. This gives you the advantage of less spring maintenance, with more curb appeal. Grass needs sunlight for nourishment. The easiest way to deal with grass in low sunlight areas is to remove it. Between closely built houses and under trees, are great areas to consider alternative ground covers over grass. You could also try shade tolerant varieties for your region, but even they will require at least a few hours of sunlight a day. 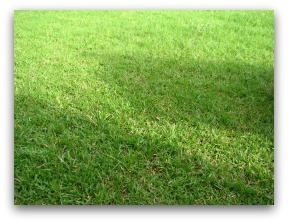 Don't forget that grass also takes in sunlight through the blade to provide nourishment. This process is called photosynthesis. Fescue is a more shade tolerant variety for northern climates of North America, while St. Augustine is used in the south. This could be different depending on the country you live in, so you should do a specific search of shade tolerant grasses for your specific area for this information. You make not like the look of a fine bladed fescue next to your bluegrass. Another thing you should consider is that not all grasses are compatible. Having lawn under trees with thick canopies is not very practical. The trees rob the sunlight, water, and nutrients from the grass. If you have irrigation, you stand a better chance of success, but you will still need some sunlight. There are a few more things to help as well. Pruning the canopy to allow more sunlight through will help. You can also consider removing the lower branches on larger trees. Your best bet along the driveway is an alternative ground cover. Decorative rocks, mulch, and edging can be more practical, and provide nice clean lines. You will also have with more curb appeal with less maintenance. Sometimes our problems are just due to incorrect watering, mowing, and fertilizing. These are simple problems to deal with. We have put together a basic section on all of these for you on lawn care and maintenance. This section is designed to give you a beautiful lawn, and prevent problems before they happen. When mother nature turns off the tap, your grass will go dormant to protect itself. This is something that you just have to live with unless you have in-ground irrigation. It is becoming more and more acceptable to allow lawns to go dormant during times of drought. We live in a world where it is more environmentally conscious and acceptable for people to conserve water. During times of drought, decide if water or dormancy is the better option for your lawn. “ON” “OFF” watering during drought may actually be doing more harm than good. If you don't have consistent watering practices during times of drought, let it go dormant. It is more of a shock to the lawn going in and out of dormancy. You should also visit our mini-module on watering. We also talk about correct watering practices that can help your lawn resist small periods of drought. A deep rooting lawn is the key. For this you will need to train your roots to grown deeply into the ground. This leads to another related subject. How well does your soil hold the water? You will experience water runoff much faster with clay soils. 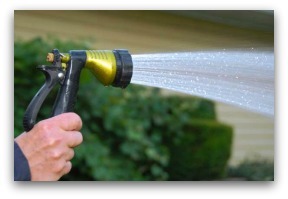 If you do not change or amend it, you may have to employ an “On” “Off” method of watering. This is better than wasting water. You can improve clay soil over time by core aerating and topdressing with organics. Humic acid can also be used. If you haven't been in tune to research on this subject for a while, adding sand can have negative effects if not used properly with other amendments. It is recommended to use organics when amending clay soils. Sandy soil drains quickly. You may have to water sandy soil more frequently, but you will use less water each time. Adding organic topdressing will improve sandy soil over time by improving water retention capabilities. Rich loam falls in between these two types, both holding moisture, and draining well. The benefit of having a well established, thick, and deep rooting lawn, is better water retention, and resistance to weed takeover, drought, or diseases. This can be one of those never winning battles. The best solution for this, is to train your dog NOT to go on your lawn. If this is not possible and you really love your pet, you are going to have to put up with the risks. 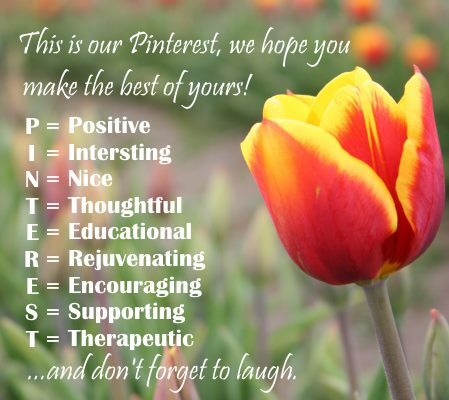 Here are a few other alternatives for you to check out. If you are lucky enough to catch your dog when he is using your lawn as a bathroom, you can soak the area with lots of water. This will dilute the dog pee, and prevent the burning of grass. Unfortunately, we don't always run around after our pets with a bucket or hose. There are also quick repair patches available like this one. When it comes to the different pills or biscuits on the market to give pets, this borders on medication. Whether they are all natural or not, we are not prepared to give medical advice on this site. Some say they work, others say they don't. I have also heard about some pills causing liver or kidney disease. Whether they are safe or not for pets, is a decision that your local vet should be making. Our job is let you know that they exist. There are also “Dog rocks”, which are another natural alternative. This is a product that is left in the dog's dish. It is a very interesting product, and if you have never heard of it, you should take a look at it. Please click on this link to our product profiles section. The best option may always be to build a dog run. A dog run is simply a fenced in, or contained area separated from the rest of the lawn. Training your dog to do his “duties” in this area will save the rest of your lawn. If you are interested in how to build a dog run, you can click on this dog run link. There really isn't a whole lot you can do with spills except prevent them. We have given this tip before in our fertilizing section. The best thing to do is refill gas, and fertilizers when on a driveway or sidewalk. If you have to fill your mower or spreader, then push it over to the driveway instead of doing it on your lawn. 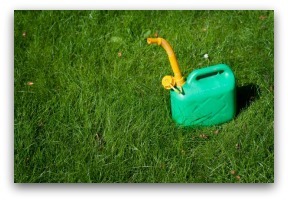 Don't refill chemicals, gas or fertilizer spreaders on your lawn. It is advisable to refer to the manufacturer's instructions on the label of the product you are working with. In most cases, you can try diluting with heavy amounts of water. If this does not help, you may have to reseed the area. Some products will affect the soil in ways that will prevent grass seed or sod development. If this is the case, you can try neutralizing the soil from the effects of what you have spilled. This may or may not work, depending on what it is. Activated charcoals are great soil neutralizers. So those are some minor repairs or preventive maintenance tips. If your problem is more serious than that, you may need major repairs. If you are looking for seeding small patches, please see the How to Seed Lawns section for tips. Let's move on to Renovating Lawn options.